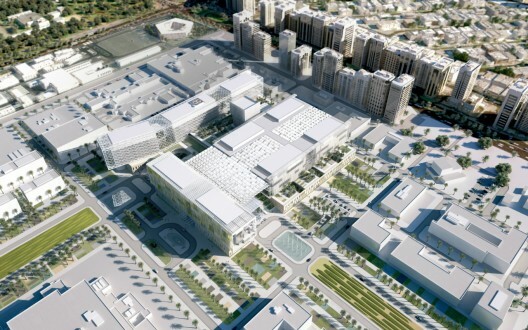 Saif Bader Al Qubaisi, Chairman of Abu Dhabi Health Services (SEHA), has unveiled plans for the new three-million-square-foot, 838-bed Sheikh Khalifa Medical City (SKMC). 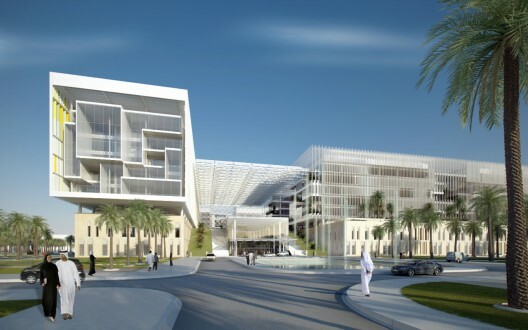 The new complex, designed by Skidmore, Owings & Merrill LLP (SOM) in a joint venture with ICME and Tilke, will replace the existing Sheikh Khalifa Medical City and provide expanded medical, pediatric, and trauma care for the residents of Abu Dhabi. Continue reading for more images and the architect’s description. 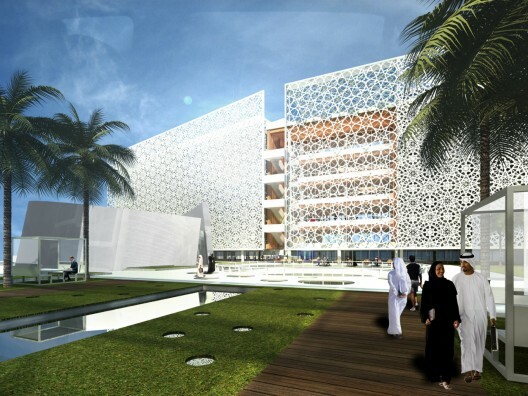 With construction scheduled to start in 2013, Sheikh Khalifa Medical City will combine a general hospital with a level-one trauma center and women’s and pediatric hospitals. Given the massive scale of this project, creating a hospitable sense of character and overall unity for the entire facility – while conveying a sense of identity for each individual hospital – is one of the primary design challenges. Envisioned as a “city within a city,” the design endeavors to create a new paradigm for a medical center, one that is more like a bustling campus, with vibrant public spaces and a sense of community. Informed by historical regional precedents, the design seeks to strike a balance as a state-of-the-art vision rooted in local heritage. The design responds to, and is respectful of, the unique culture of the UAE and its demanding desert climate. The primary architectural challenge of the project was to balance the client’s desire to create distinct identities for each of the three hospitals, while maintaining an overall unified expression for the medical city. This was achieved by developing a series of unifying and differentiating components. The medical city’s heavy stone plinth – a reference to the ancient architecture of the region – serves as a common pedestrian-scaled expression, within which the most intense medical functions will be found along with shared amenity spaces and light-filled courtyards. The roof of the plinth is home to a network of gardens that also serves to unify the bed towers that rise above. 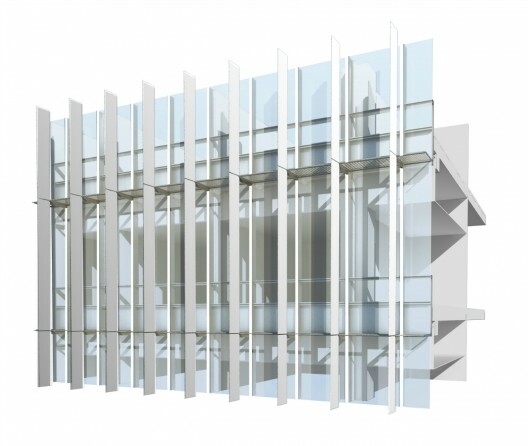 The architecture of the bed towers communicates the identity of each hospital within a common vocabulary. 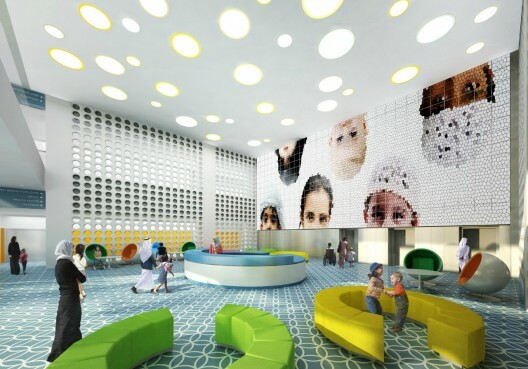 The exterior sun screens, which characterize the bed tower facades, will vary from the simple rhythm of the general hospital to playful colors and patterns of the children’s hospital to the intricate mashrabiya-inspired geometries of the women’s hospital. 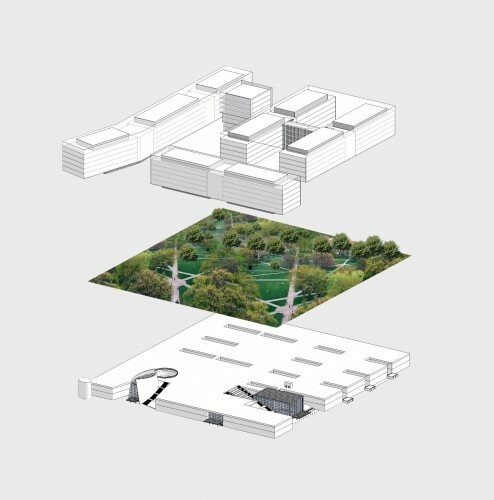 SOM created a centralized, orthogonal plan that establishes a clearly defined sense of place. The facility’s base – a two-story plinth – houses a comprehensive array of medical functions, shared among the three hospitals. 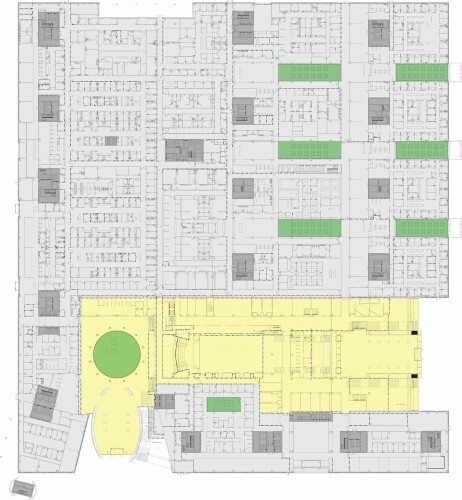 The ground floor will hold the adult and pediatric emergency departments, the women´s urgent care center, and all outpatient departments. At the heart of this floor, the diagnostic and treatment center serves all departments in the complex. The second floor houses inpatient and day surgery, intensive care units and related functions. On the main garden level above, the LDR, NICU and C-section ORs are located along with rehab and infusion. Rising above this shared plinth, the nursing areas give identity to the individual hospitals and address the specific needs of each patient population. 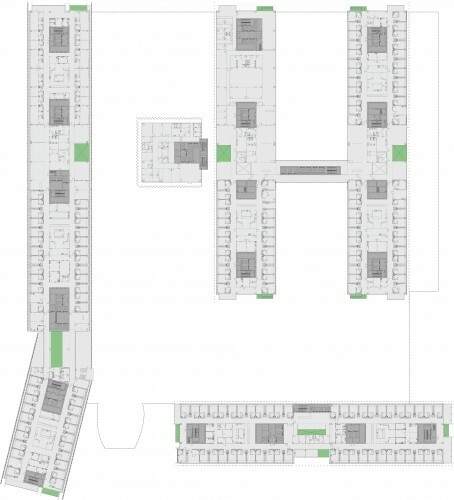 Below grade, an extensive network of spaces is vertically integrated to support the medical functions above. Staff and visitor parking are located in a sub-cellar. Embedded in the plinth and at the heart of the medical campus is a vibrant “town center” comprised of lobbies cafes, retail and education spaces. This lively and interactive multi-level space connects to a network of open spaces above the plinth. Located at the convergence of the two entry drives that connect the campus to the city, this town center perhaps best exemplifies how this project re-visions the building type and serves to define and distinguish this medical campus as a true center within the urban fabric. The design of the medical city is based on the belief that patients are guests and everything about the facility supports that notion of hospitality. The patient and visitor experience is carefully controlled to minimize exposure to the back-of-house components of the facility. Lobbies and other public spaces convey a sense of serenity through spaciousness, natural materials and diffused natural light, while courtyards and terraces engage building interiors with the outdoors. Like the exterior architecture, which expresses distinct identities developed from a common language, the interiors will be unified yet uniquely branded. The shared public spaces within the plinth will serve as connective tissue, while the lobbies and bed tower interiors of General, Women’s and Pediatric hospitals will express their own similar yet distinct identities. As a whole, the interiors will be comfortable, tranquil and reassuring – creating a sense of calm for patients while instilling confidence that they are within the confines of a world-class health care institution. 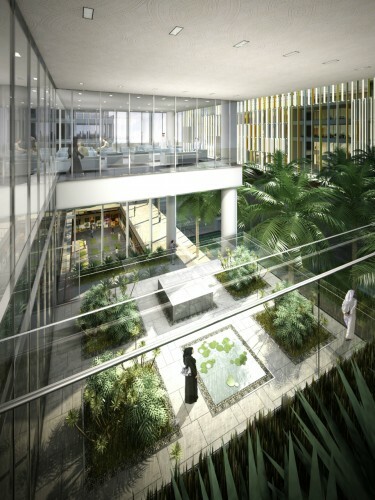 From the landscaped entry drives to the main garden level and the light-filled courtyards that perforate the plinth, the medical city’s gardens will create a calm and healing environment. 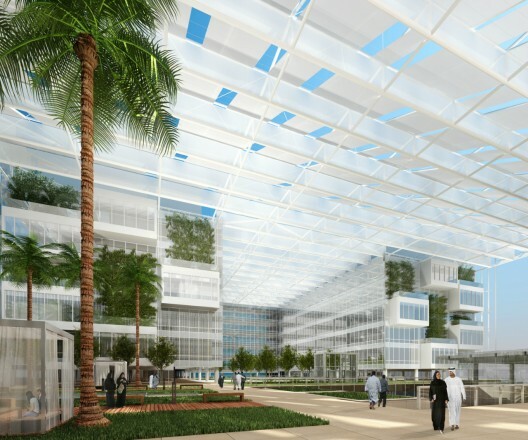 The diverse network of open spaces is considered essential in establishing a tranquil atmosphere and in crafting the campus-like environment that will help to distinguish this medical campus. The green space strategy begins with the two tree-lined entry boulevards which transition into a grand garden oasis at the center of medical city. This shaded garden, on the roof of the building’s plinth, is accessed from below by gracious interior and exterior stairs and activated by adjacent cafes, conference areas, and family waiting areas. Within the plinth, itself, a series of courtyards serves to bring light and nature into these large floor plates, thereby mitigating the sense of distance, assisting in way-finding and creating a more tranquil atmosphere in this medically intense setting. Above the plinth, the bed towers will be woven with a series of sunlit terraces, hanging gardens and adjacent family lounges. 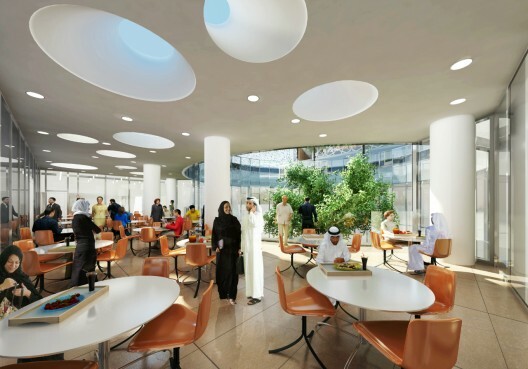 The medical city will utilize state-of-art, high-efficiency systems as well as age-old regional concepts to mitigate the extreme desert climate of Abu Dhabi. 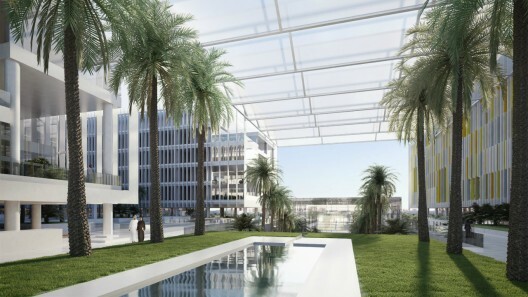 From roof-top solar collectors to the simple fabric scrims that will shade the main garden level, a comprehensive climate strategy is designed to achieve a Two Pearl certified sustainability rating within the local Estidama guidelines (Abu Dhabi’s equivalent of LEED). The medical city will embrace the future sustainable growth by incorporating systems that harness, amplify and support the natural environment. Press release provided by SOM.